We had an amazing experience with Chad and Brisa. They were very accommodating to our schedules. The lessons are detailed and effective. They have many different lesson types and package options to fit all budgets. to take lessons from!! Loved every minute of working with these two! We saw Chad and Brisa at practically all wedding events we went to, so we knew they had to be good. We were looking to feel more comfortable on our day with just a few extra moves we could do other than sway back and forth. They taught us our first dance that was a mash up of two very different songs. We learned so many good principles of dance that we can apply all our lives anytime we want to dance. This isn’t just an investment for the wedding day, but for the rest of your lives. We took 10 private lessons. We had so much fun on our wedding day and our audience was impressed with our dance. We would do it again in a heart beat! As an event professional I hand pick only the best for my clients. After meeting Chad I knew all of my dance needs would be taken care of for both personal and business use. Chad takes the time to make everyone feel comfortable about themselves which lets your body just flow to the beat. He taught me moves I never ever thought I had. I truly enjoy taking his classes. It is like a form of therapy for me, I loose all the stress I have built up and just find myself at peace while learning something fun. I also use Chad professionally at all my shows to come and teach people how easy and fun his classes really are. His years of experience and staff is very professional and kind. They do not demand things from you that you can not do or are uncomfortable with doing. Instead he recreates and finds the perfect fit for you. I love to watch the couples he teaches for their first dance at their wedding. You really see the love and confidence in their eyes and they really light up the room. Thank you Chad for all the rhythm and love you bring to all our hearts. My fiance and I saw Chad and Brisa's great reviews on the Knot and decided to check out their classes. We were blown away with their skill level, teaching style, and ability to train complete beginners like ourselves. They start with the very basics and teach you the mechanics behind each and every step. With their easy-going personalities and expert training, you will soon be spinning around and doing moves that you never thought would be possible- especially for your first dance! We get married this coming weekend and are not at all nervous about our dance thanks to Chad and Brisa. If anything, we have had a fabulous time in all of our lessons and are greatly looking forward to seeing our friends' and family's reactions! Thank you Chad and Brisa! My fiance and I took lessons with Chad and Brisa before our wedding. I had worried that we were cutting it too close to the wedding and would end up doing the junior high standard of awkwardly rocking back and forth. Chad, however, assured us that it was never too late and he and Brisa were able to accommodate us for multiple lessons in just a couple of weeks! Neither of us had danced before but Chad and Brisa were very patient and made us both feel at ease and made learning to dance fun (we laughed a lot!). They taught us the basics and choreographed a first dance that we could handle learning in the time before the wedding. They even let us video the two of them performing it so that we could practice at home between lessons. Chad and Brisa spent a lot of time with us getting us to where we needed to be for our wedding. As a result, our first dance was beautiful and we received so many compliments from our guests (and some really adorable video footage of our flower girl and ring bearer trying to emulate it!). I can't speak highly enough of DanceWithChad. If you need lessons to prepare for you big day, reach out to Chad! Can't say enough about Chad and company! Overall it was a fabulous experience - so easy to learn and the finished product looked great! 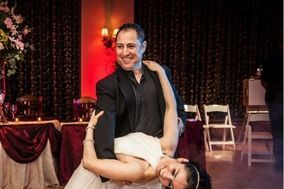 I had not taken dance lessons as an adult and my fiancee had taken a few swing lessons many years ago so we knew we wanted help to avoid doing the "high school shuffle" at our wedding. We took several group lessons and about three private lessons with Chad and his team during which we learned the basics (not by counting), created a routine to our song with Chad and had 1-1 practice time to perfect the routine....the finished product was fabulous! We very much enjoyed the experience with Chad learning to dance - they made it very EASY to learn and we felt supported and encouraged every step of the way. Definitely recommend Chad and Team! Chad and Brisa were wonderful to work with. Our first dance looked amazing and we got so many compliments on it. Chad choreographed the first dance for my husband and me. He taught us moves within our skill range and let us video the dance so that we could go home and practice. We did follow-up sessions with Roni, Chad\'s assistant. She was great! Not only are her prices more affordable, but she really kept us on task and we got a lot of work done with her. My dad and I also learned a dance taught by Roni. Both Chad and Roni were very flexible with schedules and worked to fit us in, even at odd times (since my family and fiance are both out of town). I would definitely recommend Chad and Roni to anyone who wants to do more than the \"prom sway\" out on the dance floor. We worked with both Chad and Yvonne and found them to be great to work with in choreographing a fabulous first dance for us. They worked with our already very hectic schedules to squeeze in as many lessons and practice sessions as possible. They both were very encouraging and had a lot of confidence in us, even when we didn’t. Pulling off a well-done first dance was a huge wow factor for our guests, as we’ve discovered. Just know, it takes a lot of work and practice to get it right, but is definitely worth it. We took dance lessons from Chad and also had him give a swing dance lesson at our reception. Couldn't have asked for a better person to do it!